California Program That Trains Primary Care Doctors Could Get The Axe : Shots - Health News An unusual medical education program at the University of California, Berkeley is known for producing primary care doctors, unlike other schools. But it could be axed due to budget shortfalls. The unique medical program at the University of California, Berkeley is housed in its School of Public Health. 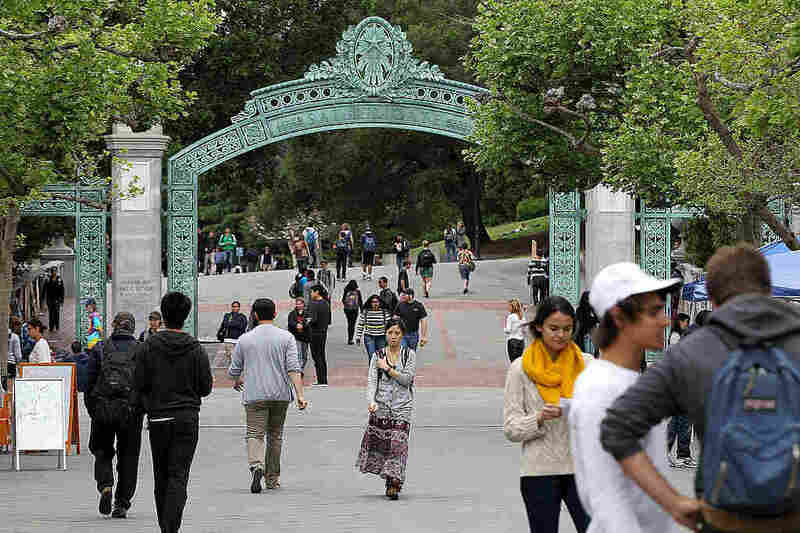 Budget woes at the University of California, Berkeley could force the shutdown of a program many people are unaware of — its medical program. The Joint Medical Program, part of Berkeley's School of Public Health, is small. Just 16 students a year are admitted. Under a university budget restructuring process initiated in February by Berkeley's Chancellor Nicholas Dirks, the School of Public Health must cut expenses by roughly 3 percent — or about $900,000. One of the items on the list to meet that target is closure of the Joint Medical Program. Losing 16 new doctors a year may not sound dramatic, but this particular population is unusual in medicine. While most medical students head into lucrative specialties, the majority of this program's graduates go into primary care. John Balmes, acting director of the program, says California needs these doctors. The state, he says, "is 43rd in the nation in terms of primary care physicians." And with the Affordable Care Act increasing the number of insured Californians, "We need more primary care physicians, not less." In 2014, just 12 percent of medical students nationally went into primary care residencies. By contrast, more than half of the graduates of the Berkeley program have gone into primary care. It's unclear exactly why so many students go into primary care. One clue lies in the program's unusual approach to curriculum. The program, established in 1971, prides itself on avoiding lecture halls and instead focusing on what it calls "problem-based learning," where students review cases as a group. In addition, the medical program is one of few nationally, says second-year student Josh Pepper, that is housed within a school of public health, and that gives a broader focus to patients' lives. "We're constantly having to question how things like socioeconomic status, insurance, housing and culture and addiction play a role in patients' health outcomes," Pepper said. It gives a more holistic perspective, he says. "We develop a whole skill set you don't normally get at a traditional medical school." Pepper has helped launch an online petition in support of the program. It's called a joint medical program because students do three years at Berkeley's School of Public Health, during which they do an original research project. They then go to the medical school at the University of California, San Francisco for two years of clinical rotation. They graduate with a master's in science and an M.D. A report earlier this year commissioned by the California Primary Care Association detailed the shortfall in primary care providers in California. The state's ratio of primary care physicians in its Medicaid program, called Medi-Cal, is roughly half the federal recommendation, it said. By 2030, the analysis predicted a shortage of more than 8,000 primary care doctors. "Certainly with the shortage we are facing, we should not eliminate any existing programs that we know have successful track records into funneling people into primary care," says Carmela Castellano-Garcia, president of the California Primary Care Association. "We cannot afford that at this time." All of Cal's professional schools, including the School of Public Health, must trim expenses by the same rate, says Dan Mogulof, a spokesman for the university, and it's up to the schools themselves to determine how to meet the target. Linda Anderberg, director of communications for the School of Public Health, said it is considering several options to achieve the budget cuts. "The school does not want to lose the program," she says. She stressed that no decisions have been made and that the process would be completed during the summer. Most of the cuts would not go into effect until 2018, she said. Meanwhile, staff and students are speaking out to try to save the program. "If I had to go to medical school all over again, I'd want to do it in the Joint Medical Program," says acting director Balmes. He says there's an advantage to being in a small, supportive environment. "I think that translates into very fine doctors, because they're good human beings as well as good doctors," he says. This story was produced by member station KQED's blog State of Health.